As you guys know, designing Little Lady June's nursery has been quite the exciting event. After learning that she is a she, we quickly switched up our design plan for the room. And I'm kind of loving how it has come together! I knew from the beginning (um, like a month ago!) that I wanted to pair a sweet ballet slipper pink with a bright, magenta pink. So when I saw the new spring Target Threshold collection, which includes a sweet pink Botanic Blush line, I was immediately smitten. The collection is perfect for LLJ. First off, this bench. I die. The color! The gold legs! The tufted top! 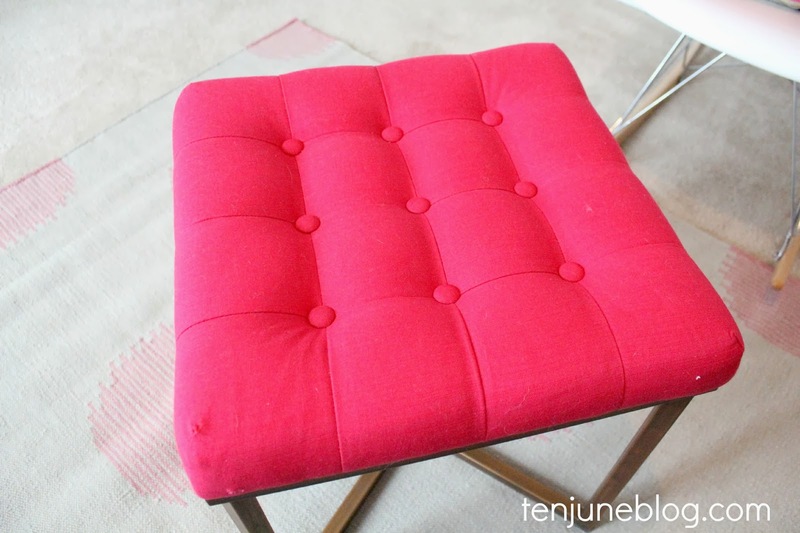 It's going to make the perfect foot stool for me to use to rock Little Lady June to sleep every night. 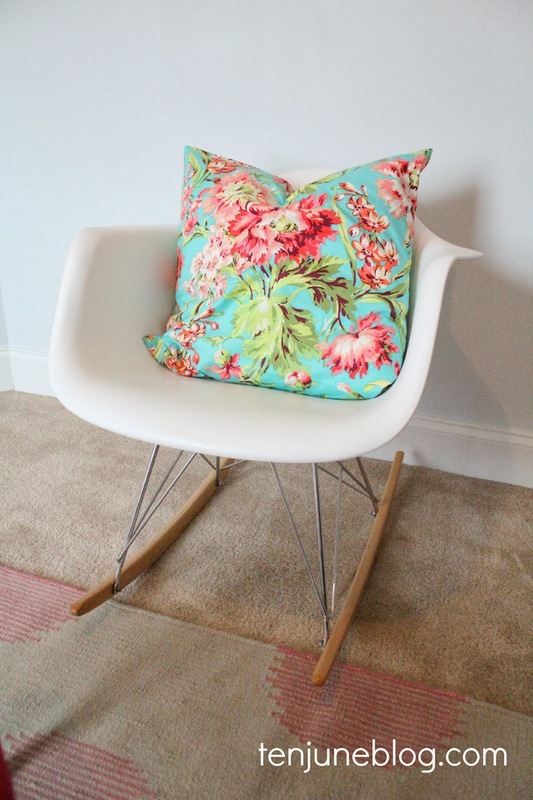 Right now, I have my trusty wannabe Eames rocker in her room, holding the place for HDawg's glider. My parents passed on a wooden rocking chair for us and we will use that in our master bedroom while little gal sleeps in a bassinet next to our bed for the first couple of months. Once she moves into her room, we'll move H's big ol' Pottery Barn glider into this space. 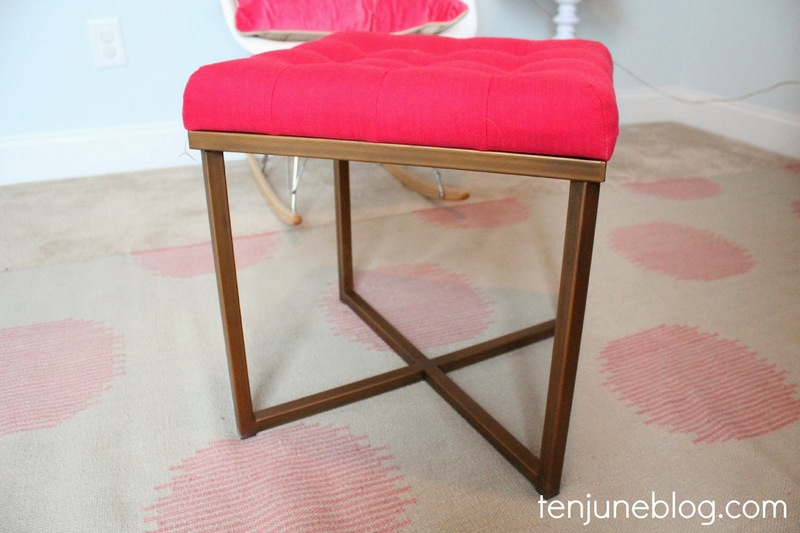 Don't worry, we've tried it out- the Target pink tufted foot stool looks fabulous and fits well with the glider. Not only is the glider going to be more comfortable for late-night nursing sessions, it's going to be a lot larger than the Eames chair to hold my awesome new pillows. 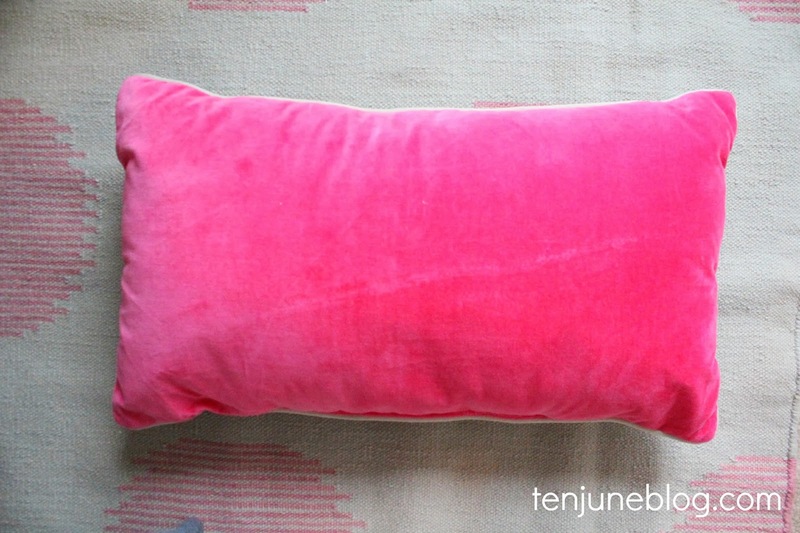 This hot pink velvet lumbar pillow is kind of a dream come true. Seriously, it's beautiful, right? And the lumbar pillow pairs so wonderfully with this perfectly girly, floral print pillow I picked up from The Lacey Placey. I'm so smitten with the pillow's pretty pinks, fun turquoise color and large-scale florals. It's one of my favorite things in Little Lady June's nursery! Isn't this just every little girl's design dream? I also picked up the white pedestal table at Target and topped it with some picture frames and my Nana's milk glass lamp. 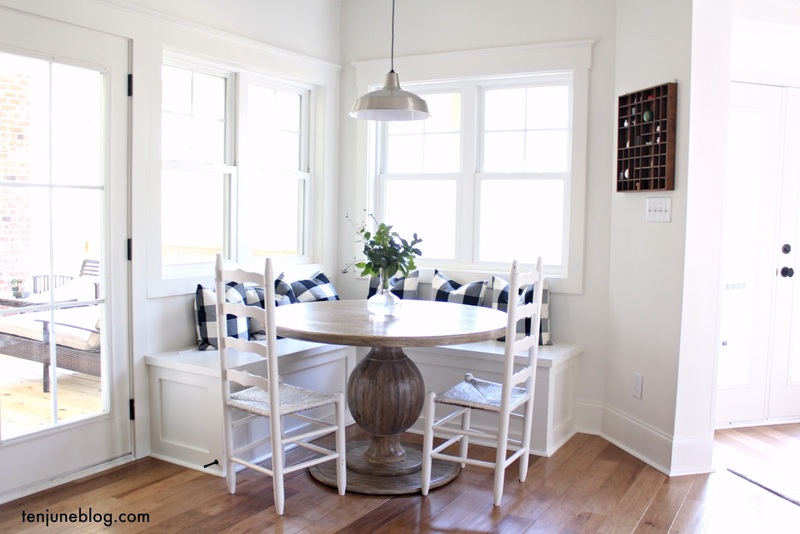 I decided that I don't love the bright white of the table with the off-white color of the glider, so I plan to paint the table. I'm thinking a pretty ballet-slipper light pink. But for now, I'm super preggo and don't need any new projects on my list, so I simply added a few gold polka dot decals to the little table to dress it up for now. Do you guys like it? I'm not sure if I do, but it works for now. Be honest, what do you think of the polka dots?! I'm loving Little Lady June's nursery so far and we're having so much fun seeing it come together! Lemme just say, I am totally crushing on gold polka dots right now... but I'm seeing the gold polka dots on the table once it's painted that ballet slipper pink. Ooo la la! so fun! loving the pink and gold and dots! Love everything! The table will be adorable in pink. As to the polka dots, don't like them on the bottom, and I would take a few off of the top and space them out a bit more. IMHO I think there are just too many. Love the combination of the magenta pink and gold! There is something so classy and charming about that combination. Cant wait to meet her! 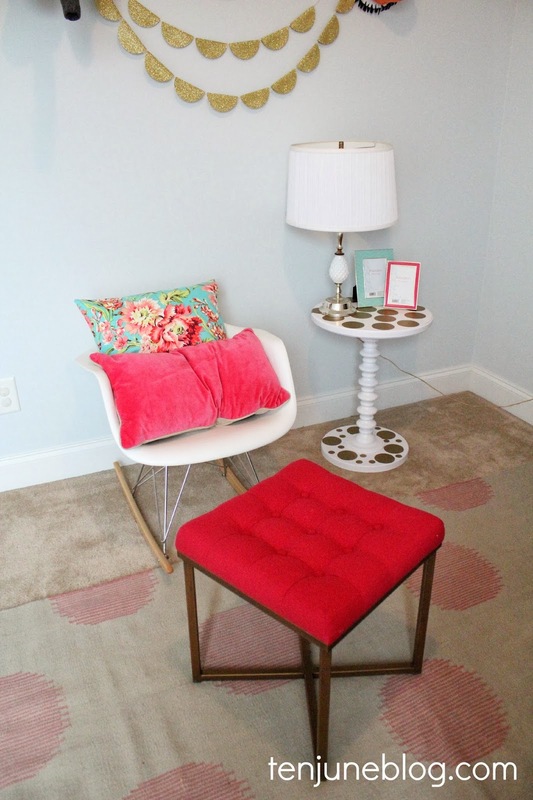 Love the footstool, love the floral pillow and the overall plan. The polka dots are a bit much for me. I'd try just having them on the tabletop (and not the base), or move them somewhere else altogether. I do think light pink would be sweet.